Dogecoin is a decentralized, peer-to-peer digital currency that allows to easily send money online. Created by Billy Markus and Jackson Palmer in 2013, the cryptocurrency was meant to reach a broader demographic than Bitcoin. Known by the ticker DOGE, this digital coin was started as a joke. Designed to be just a fun currency, it was named after the doge meme of Shiba Inu. “Dogecoin sets itself apart from other digital currencies with an amazing, vibrant community made up of friendly folks just like you,” reads a post on the project’s website. 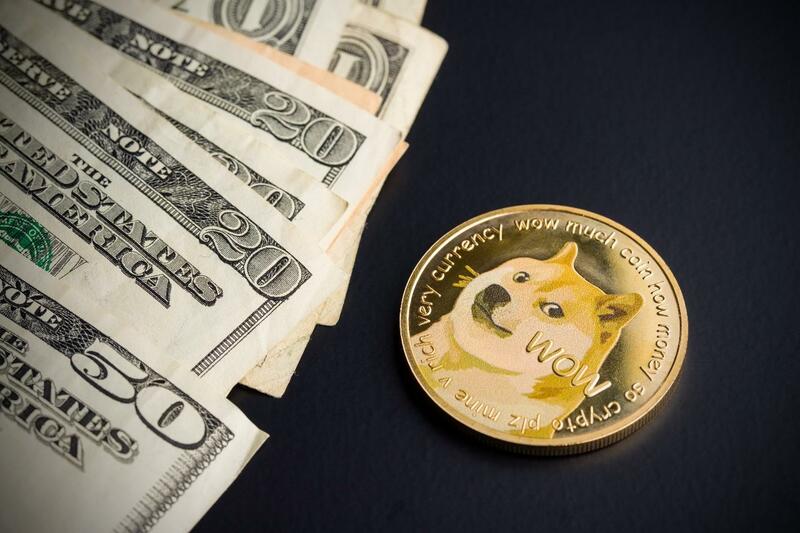 Although designed to become a joke currency used to reward meme creators, Dogecoin soon rose in value and attracted a whole lot of internet communities and thousands of users. The coin ended up among the top cryptocurrencies on the market. Dogecoin is currently ranked 20th on price tracker CoinMarketCap.com. A single coin costs $0,005021. The total market capitalization stands at $585,342,125, the daily trading volume reaches $12,207,020. There are currently 116,585,266,244 Dogecoins in circulation. The Dogecoin system has no cap on the number of coins that users can mine. As long as miners continue operating, the Dogecoin supply continues to expand. On December 19, 2013, Dogecoin jumped nearly 300% in value in 72 hours, rising from US$0.00026 to $0.00095. This growth occurred against the background of Bitcoin and many other cryptocurrencies reeling from China's decision to forbid Chinese banks from investing in the Bitcoin economy. According to Blockonomi, Dogecoin was created as a fork of Luckycoin, which itself was a fork of Litecoin. Therefore, Dogecoin contains a number of characteristics that are similar to Litecoin but not identical. For example, it uses the Scrypt algorithm which was originally designed so that Bitcoin ASICs could not mine it. However, Dogecoin's implementation differs from Litecoin by some parameters. Thus, Dogecoin's block time is one minute as opposed to Litecoin's two and a half minutes. Getting started with Dogecoin is as easy as 1, 2, 3. First, it’s necessary to download and set up MultiDoge, a local Dogecoin wallet for Windows, OS X or Linux operating systems. There are numerous ways to get Dogecoin. One can buy them, trade in for them, get tipped, "mine" them, and more. The easiest way to get the first Dogecoins is from faucets such as DogeFaucet or Indogewetrust. The websites provide a small amount of Dogecoin for free to introduce users to the currency. All one needs is a Dogecoin address. Dogecoin can be traded on a number of cryptocurrency exchanges including Gate.io, HitBTC, Poloniex, HitBTC, Bittrex, and others. 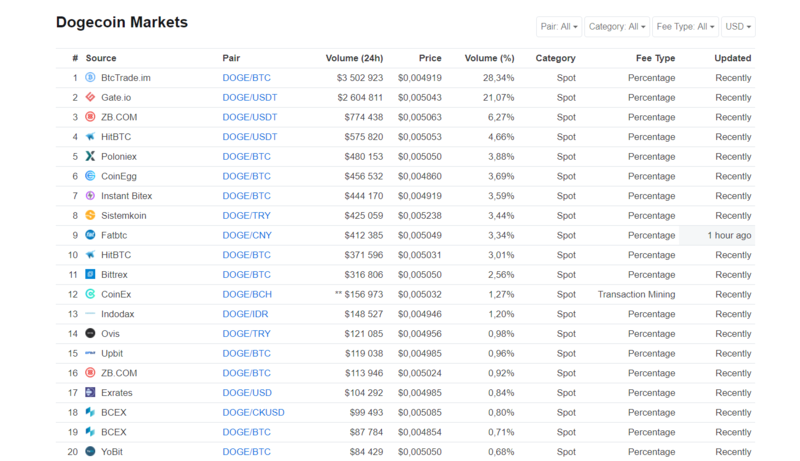 BtcTrade.im is the largest market for Dogecoin. Dogecoins can also be obtained through mining. Some of the best mining pools include Aikapool, Litecoinpool, 1CoinPool, Multipool, and Prohashing. The Dogecoin Foundation is a non-profit organization created by the Dogecoin community to facilitate the use of Dogecoin through goodwill, promotional and charitable endeavors. The Foundation helps promote Dogecoin, so more and more people know about it. The Dogecoin community and foundation have encouraged fundraising for charities and other notable causes. In January 2014, the community raised $36,000 worth of Dogecoin for Jamaican Bobsled Team, which had qualified for but could not afford to go to the Sochi Winter Olympics. Furthermore, $7,000 was raised for a second Sochi athlete Shiva Keshavan. The Dogecoin Foundation later raised over $30,000 from more than 4,000 donors to build a well in the Tana river basin in Kenya in cooperation with Charity: Water. 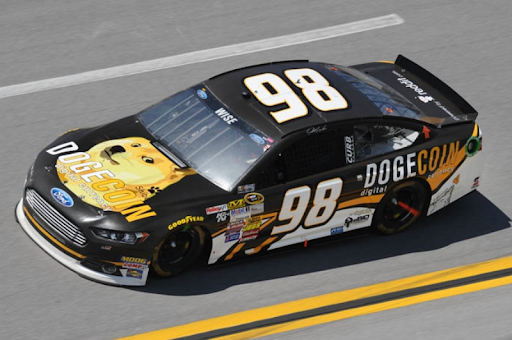 In March 2014, fans donated more than 65 million Dogecoins (around $55,000 at the time) so that driver Josh Wise could compete in the iconic Talladega Superspeedway Nascar race. 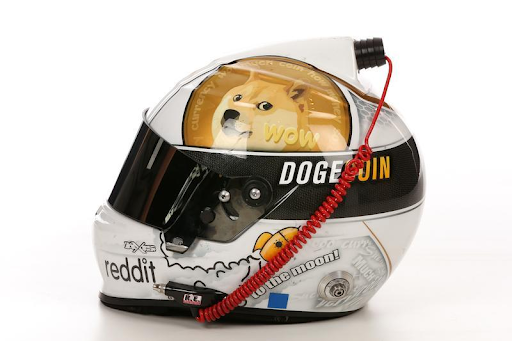 During the following race in the Coca-Cola 600, Wise debuted a Dogecoin/Reddit.com helmet. Wise later announced he would run the car again at the Toyota/Save Mart 350 as a thank-you gift to the community and the GEICO 500. He finished 28th in the race due in part to a refueling issue. DogeWallet hack in late 2013 saw millions of coins stolen. However, the troubling incident also allowed Dogecoin to become a trending hashtag on Twitter at that time. None of the coins stolen were ever recovered, but the Dogecoin community pooled together enough funds to compensate affected users through the “SaveDogemas” event. Dogecoin Listed on Robinhood Crypto — In July this year stock trading app Robinhood listed Dogecoin on its commission-free cryptocurrency trading platform. 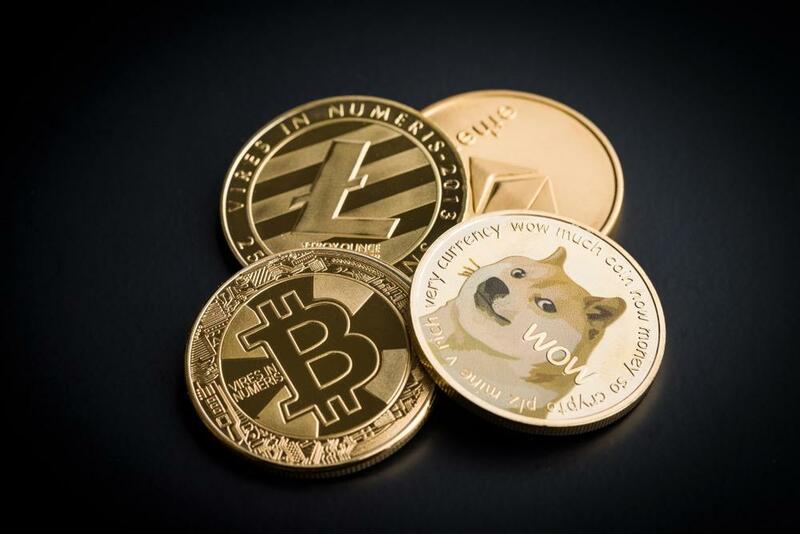 Dogecoin Prepares For Potential Coinbase Listing -— Dogecoin (DOGE) now has an opportunity to list on Coinbase after the company announced that they will be easing their requirements for listing new coins. Coinbase also announced that they will not require any fees for new listings, but they might re-introduce them later. Elon Musk asks Dogecoin creator to help fight crypto scam bots on Twitter — The CEO of SpaceX and Tesla Elon Musk asked Jackson Palmer, the creator of Dogecoin (DOGE), to help him combat "annoying" cryptocurrency scammers on Twitter. The creator of Dogecoin promised to send Musk the script that could solve the problem. So, conceived as a joke, Dogecoin may look suspicious from an investment point of view, but its vibrant community and fundraising-side initiatives make it a pretty exciting project to follow.